Color can become identity in the eye of the beholder. We look at a bottle, and the color registers more as a feeling than a thought. We instantly recognize an old friend on the shelf by the label and, more subtly, by the color. Color touches us at a mostly subjective level. Green shirt? Blue shirt? The little black dress? Lady in the red dress? The decision seems insignificant, but we don’t put it on until we’ve decided. Something in us responds to color, and makes color decisions around memories and pleasure, or even pointed belief. Noted composers Franz Liszt and Nikolai Rimsky-Korsakov had an ongoing disagreement around what color B-flat is. Which brings up synesthesia (union of the senses). There is an association between seeing a color and experiencing taste and sound, even space and emotion. I think I was at that concert. Campari speaks as loudly through its redness as it does through its brand name. It is very well recognized and appreciated. When established by Gasparo Campari, he used cochineal for the iconic red color. When the company switched from using cochineal—a beetle—as its colorant to other dye sources in 2006, Campari remained a close shade of red. Some quibbled about taste and body, and there was crying about the new hue, but it still looks about the same. Red. And business is fine. Thank you, Count Negroni. Curaçao is a name used by a number of firms to define their orange-peel-based spirits. Known for its blueness, it is still made on the island of Curaçao, off the coast of Venezuela. The lone producer remaining on the island is Senior & Co., which now produces a rainbow of liqueurs—blue, red, green, yellow—from the same liquor and locally-grown, bitter orange fruit. Same spirit: different colors… just for fun. With absinthe, famous like Kermit for being green, color now comes from post-distillation addition and maceration of green plants or from commercial color. Before being banned early in the 20th century, some unsavory producers allowed poisonous copper compounds to find their way into the bottle, creating disrepute and some undoubtedly profound hangovers, contributing to the pitchfork-and-torch fever leading toward the ban. Chartreuse, now known as a color as well as a spirit, named for the Grande Chartreuse monastery, is rumored to derive its electric green from a (closely-guarded) formula of 130 botanicals. The colorants available to an adventurous bottler are in the hundreds. Many commercial colorants are produced from coal tar or synthesized. Then there’s that beet in the back of the fridge. For craft distillers who strive for consistency behind their label, yet appreciate that craft is not the same as machining parts, producing your own colors from natural ingredients is a reasonable thought. Natural colorants, due to their pH value, enzymes and other characteristics, may react with the spirit to produce a perfectly stable product. Or they may react to cause flocculation (clumping) and settling of suspended solids. Or simply fade. Until a distiller actually makes a bottle and lets it sit for five years, the results cannot be guaranteed. Plant-based recipes for producing certain colors in distilled spirits may require trial and error to perfect. Trace elements, which vary depending on base material, heads and tails cuts, other additives and a variety of variables, may alter the shade and intensity of a particular organic colorant. For American distillers, there are regulations to pay attention to, and concerns about shelf appeal and stability figure in. Many colorants are labeled as natural, although the term is used pretty loosely. The ability of a colorant to remain stable and stay in suspension is a major concern. Some people who care for a certain spirit may not be too bothered by imprecise color or some sediment at the bottom of the bottle. Aesthetics and apprehension toward change keep well-made commercial colorants in demand. As producers move toward more natural ingestibles, plant-based colorants produced by reputable firms are popping into view. Generally, one won’t run afoul if the ingredients used are in compliance with the Food and Drug Administration’s Generally Recognized as Safe (GRAS) listings and with the standards of the TTB regarding formula and labeling. But U.S. and EU regulations and labeling rules are diverse, and differ in ways that are hard to chart: These waters are best navigated by a professional. How a particular colorant works with a particular spirit will always be unique. Different source materials and different methods of extraction (i.e., water, ethanol) along with pH value and miscellaneous compounds in the spirit could result in unanticipated results. Boiling red cabbage in water yields purple. The right amount of baking soda produces blue. Adding lemon juice delivers green. And Then There Was Brown. Outside colored specialty products, the spirit world is mostly clear or brown. A new-make rum can be colored, or an aged rum may have its barrel-imparted color filtered out. In the U.S.A., certain whiskeys may contain coloring agents and, under the Code of Federal Regulations (CFR), others may not. The point of barrel aging is to let the spirit work the barrel and the barrel work the spirit. The point of caramel coloring is to let the color work the mind. Barrel aging yields color, some sweetness and other nuances. Darker generally means older, which implies well-aged, therefore pricier, something not lost on bottlers. Some prominent whiskey producers have done their own trials and seem to think that after 8–10 years most barrels have given their best, but will certainly keep giving color and new flavors going ahead. Most blended Scotch and Cognacs are acquainted with caramel coloring. This is a carefully planned part of the production process, which guarantees your next bottle of Old Friend has the same healthy glow as your last bottle of Old Friend. Whiskey and brandy coloring regulations are rather specific. In the U.S.A., bourbon and rye whiskeys may not be colored. Period. Neither may whiskeys that are labeled as straight. Some other U.S. whiskies may contain up to 2.5% caramel coloring. Caramel coloring, as used in spirits, generally means some type of carbohydrate (sugar) that has been cooked as a syrup, removing all water, to a point of near immolation, giving a black concentrate that when diluted yields shades of gold to mahogany. Available concentrates are bitter rather than sweet. Enhanced caramel that contains sulfites or ammonium is allowed in foodstuffs but is banned in spirits. Distillers may choose to create their own caramel, which can be stopped short of total caramelization and retain some sweetness. Rules ruling rum are fairly liberal. Rum may be colored or, if barrel-aged, have its original clarity restored. Some regulations spell out that the caramel is only for coloring, and blind taste tests have mostly supported this… mostly. Caramel coloring is allowed in French and American brandies, and many use it. The French allow the addition of water, caramel, syrup and boisé to Cognac. Boisé is made by simmering bits of oak below the boiling point and reducing the water content. It is often barrel-aged for decades before being blended with the brandy to convey rancio, the taste of age. Rancio is hard to describe, but once recognized becomes familiar, not unlike umami. Though the liquid itself is dark, it barely imparts color in concentrations used. There’s a lot of room to play with color. Whether purchasing or making your own, color can leave a lasting impression. Campari was established in 1860. Chartreuse in 1764. Curacao in 1896. They’re still around. Before the first sip, the hue, clarity and intensity of color of a drink give a reassuring and familiar anticipation that I’m going to enjoy this one just like the last one. To put us in the comfort zone, it’d better not just walk like a duck and quack like a duck, it better look like a duck. Chef Michael Giacomini opened many of San Francisco Bay Area’s standout seafood restaurants. 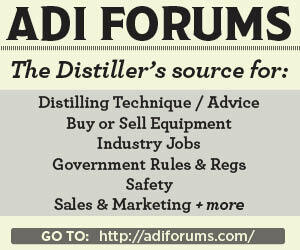 He jumped out of the frying pan into distilling in 2005, with the founding of Stillwater Spirits. Giacomini now lives in Northern California, watching the craft distilling movement from a safe distance and making tonic water.